If you are a fan of college athletics, Memorial Day is a special one. Lacrosse enjoys its annual crowning game and this year's event featured a dominant performance by Bill Tierney's Denver Pioneers. Tierney won his seventh national championship, after winning six during his tenure at Princeton (I was fortunate to be on the sideline for his sixth title). The title blazes new ground for the sport with the Hall of Fame Coach winning a title well outside the Eastern seaboard, and gives hope to the ideal of nationalizing a sport that is growing at tremendous rates across the country. Interestingly, lacrosse's growth comes at a time when people are questioning the popularity of the national past-time - baseball. 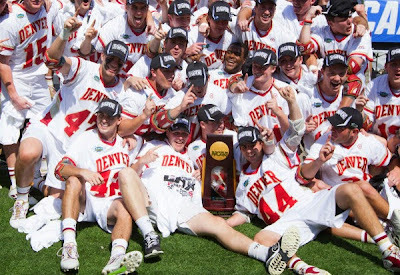 But the drama of baseball was on display just before the lacrosse national championship game during its NCAA selection show. The Bradley Braves, which hadn't been to the NCAA championships since 1968, had a strong RPI yet were considered a bubble team. Bradley waited throughout the entire bracket announcement at a local restaurant with the public and media in attendance to learn their fate. And in true baseball form, the game wasn't over until the last out. With 63 teams already in the field, Bradley was announced as the 64th and final team in the field, heading to the Lousiville Regional to face Michigan - the Big Ten tournament champions. This short video shows the incredible angst of the student athletes as the final bracket is unveiled and the unbridled joy that comes from having ones dreams achieved when victory is snatched from the jaws of defeat. On a day where we all gave thanks to those who served and sacrificed so that we could enjoy the freedoms that come with living in this great country, seeing the benefits of hard work and dedication provide rewards to good people made it a Memorial Day that will be remembered by the young men of these teams, and many other student athletes for a long, long time. College athletics gets it right sometimes - more times than it gets credit for. And every year, Memorial Day is one of those days.